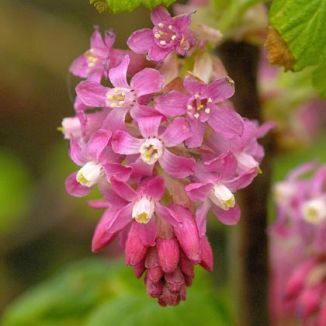 Flowering Currant is not easily confused with other wild plants on this web site. This is a very pretty deciduous shrub which was originally planted in gardens, sometimes as hedging, but now – courtesy of the birds – has been sown into the wild. Its flowers (6-10mm across) have 5 spreading deep pink sepals and 5 small pale pink petals, almost forming a tube at the centre. In the centre of the flower tube is a 2-branched style with a drop of glistening nectar and 5 yellow stamens. The flowers are borne in drooping bunches from the tips of the branches, (6–30 flowers per bunch) and they bloom from early March to May. The palmate leaves are bright green with 5 lobes and have an unpleasant scent when crushed. The dark purple berries which follow in autumn are edible but quite bitter, hence the name Ribes – from Arabic 'Ribas' meaning acid tasting. 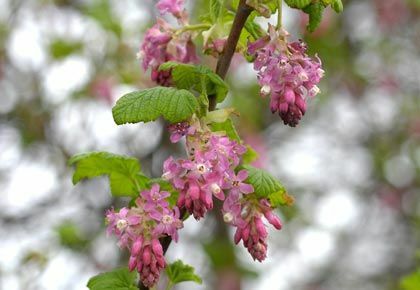 An introduced plant, Flowering Currant belongs to the family Grossulariaceae. I first recorded this plant in Dalkey, Co Dublin in 1973 and photographed it in Ballytore, Co Kildare in 2005. This plant is a native of North America and was brought to Europe in the 19th century. It is very popular with birds and insects just love the flowers.